When a friend asked today how I thought the Mets might do over the next 20 games -- a so-called brutal stretch in the schedule during which we see the Rays, Cardinals, MFYankees, Brewers, Phillies and Dodgers, with a make-up game from the Pirates thrown in there -- I flippantly suggested 19-1. The Pirates are still on the schedule, after all. Yes, that's probably going to go down as a wildly optimistic stab at the road ahead but I think I have a pretty good shot at nailing an underlying trend here: That is, we're due. I'm thinking here that the horrifying events of the last week or so steel these guys, and they start to put together the kind of run I'd like to think they have in them.Church and Murphy and even Schnieder are starting to hit. We're beginning at last to have what passes for a "regular" lineup while Reyes and Delgado sit. Last year, at around this time, Jerry's Kids started making their own move and, if you'll again pardon the enthusiasm, I'd like to believe the dumb decisions and passive approaches of April and May manifest thesmelves as experience and self-awareness that will guide them through June, July and August. I could be wrong through. But is 12-8 too much to ask? All teams will have a stretch of 12 out of 20 at some point, and I'm thinking this could be ours. Thanks for the folks below confirming that Nick Evans indeed was in uniform No. 6 tonight and shown chatting with Ramon Martinez, who's on the disabled list but may return in time to find his fourth uni number waiting for him (I'd already forgotten he spent an evening in No. 26 earlier this year, in addition to 6 this year, and 22 last year). Thanks also to the friends new and old who showed up Thursday at Two Boots Tavern's "Metstock" event. 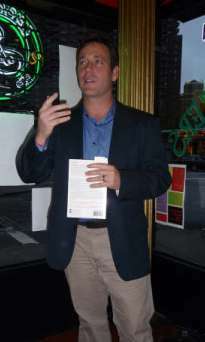 A good crowd heard a reading of a brillant chapter of Stanley Cohen's A Magic Summer; several adventures in Faith and Fear; and a dorky guy (pictured) talk about the unassailable Jeff McKnight. It was all fun till the 9th. Just a brief message to note Nick Evans is back with the Mets after Fernando Martinez was sent to AAA after a short, semi-successful tryout. You'll remember Evans wore No. 6 in his runs with the Mets last season but after nearly making the club out of spring training (only Gary Sheffield's late arrival cost him) Evans suffered a brutal start at AAA Buffalo and was sent to see psychologists and Binghamton instead and in the in-between Ramon Martinez got a brief infield gig wearing No. 6. We'll let you know what he shows up in -- I would guess 6 just for its ubiquitousness but then things could get interesting (for me at least) if and when Marttinez reappears, since he's already been in tweo numbers. Thanks for the readers who pointed out Jon Switzer's debut in No. 56 last night. I was lucky enough to be out celebrating my anniversary with my wife and missed his debut -- but we were unfortunate enough to arrive home in time to catch the 9th inning on TV. I have no explanation for all the horrendous plays we've seen this year but it's obvious there's been way too many of them, and I won't suggest Luis Castillo needs your forgiveness right now. But rather than lead an ugly campaign to make someone pay, I'm gonna suggest instead you get outdoors, have dinner with your family, take a few days off. That's what I'm gonna do. 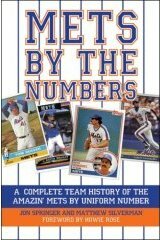 I'll be discussing the Mets by the Numbers project and will have books on hand to sign and sell (I'll even sign your pre-owned copy if you bring it along). 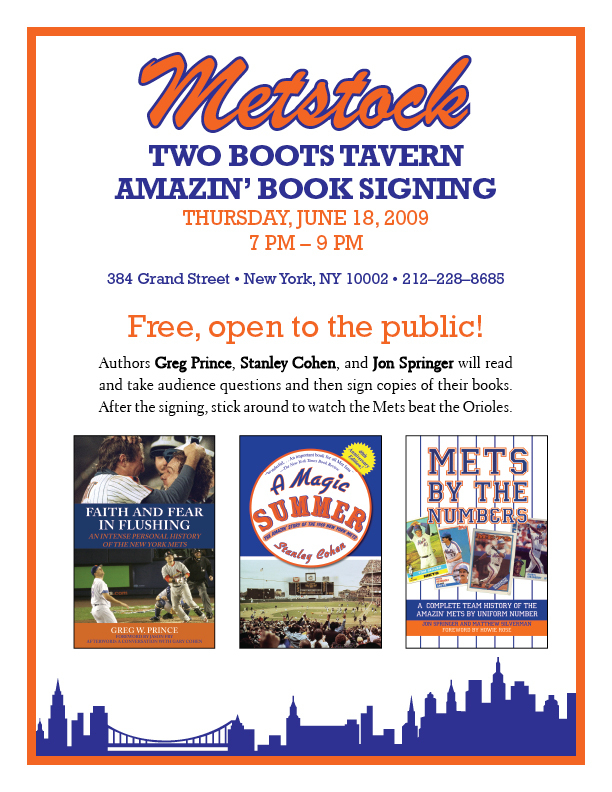 Also scheduled to read will be Greg Prince, co-writer of the splendid Faith and Fear in Flushing blog and author of the fabulous new book of the same name, and Stanley Cohen, whose 1980s classic revisiting of the 1969 World Champions, A Magic Summer, was recently reprinted by Skyhorse Publishing. I couldn't recommend either of my co-presenters' works any higher. Cohen's book has long been a favorite of mine, and is updated with a new afterword by the author, commemorating the 40th anniversary of the 1969 World Champions. If you happened to have missed it the first time around, A Magic Summer tells the story of the '69 Mets by way of the author's visits with nearly all of the members of that historic team around the time of its 20-year anniversary. Faith and Fear in the meantime tells the "intense personal history" of the Met fan experience through the perspective of the ridiculously eloquent and perceptive Prince. Two Boots specializes in Cajun-influenced pizza (the name refers to Lousiana and Italy, both boot-shaped) and its decor leaves little mystery as to the owner's baseball loyalties. The big-screen TVs will be tuned to the Mets at Orioles game. Make your plans! Today the Mets recalled Fernando Nieve from AAA Buffalo to take the place of JJ Putz who finally stopped pretending there wasn't something wrong with his arm. Nieve has reportedly been assigned No. 38. Nieve wore No. 50 in spring training, but that number went to Sean Green once Green decided he was unworthy of comparisons to Aaron Heilman (how right he was) and swapped in No. 48. Not to say I told you so but we smelled trouble long before this Putz-Green-Heilman deal ever got done inasmuch as "addition by subtraction" is a concept that works great in opinion columns and talk radio but rarely on the baseball field. I'm not saying that time hadn't come to swap away Heilman (not to mention Endy Chavez, Joe Smith, Jason Vargas, Makiel Cleto,and Mike Carp) but seeing as we're looking at a $9 million fat guy having elbow surgery, a righty specialist who's already lost his job, and a reserve outfielder, this whole deal is looking pretty much like "subtraction by subtraction" so far. Quick note: Emil Brown, the veteran outfielder signed as AAA depth recently, was called up to the active roster today as Ramon Martinez hits the disabled list with a finger injury. Brown was assigned No. 29. That number was assigned to four different guys last year, though only three of them (Jorge Sosa, Chris Aguila and Andy Phillips) wore it in combat. Alex Cora in the meantime was activated today as expected. He takes the place of cursed outfielder Angel Pagan who yesterday commenced with his customary, hot-streak-interrupting visit to the disabled list. They're really banged up right now. 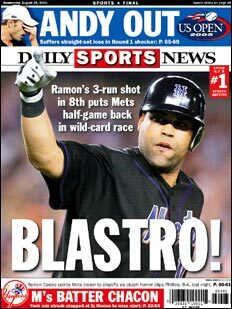 The controversy of the Mets' catching situation seemed almost too easily resolved as Ramon Castro was traded to the White Sox on the same night that Omir Stantos drove in both Mets runs, including the walkoff gamewinner, and Brian Schneider returned to the dugout for the first time in weeks. Castro, the meaty backup who'd been a reserve for Mike Piazza, Paul LoDuca and Schneider, and who provided a buttload of big moments for the Mets, was swapped for Lance Broadway, a tall 25-year-old one-time prospect.Castro leaves as the longest-serving No. 11 since Tim Teufel (1986-91). Despite ranking sixth in games played among Met 11s, Castro has more home runs and RBI than every Met 11 except Teufel and all-time leader Wayne Garrett. Broadway -- who just has to appear in New York at some point -- is assigned for now to the starting rotation at AAA Buffalo. He was wearing No. 41 in the White Sox bullpen before the trade. So the Mets today went ahead and called up Fernando Martinez from Buffalo and started the 20-year-old in right field against the Nationals. He was issued No. 26 -- a number Met fans of my generation will probably always associate with Dave Kingman. Some commenters have already speculated that won't be a long-term placement, given Ramon Martinez had a one-game appearance in 26 only a week ago, and I suppose I wouldn't be surprised at some point for a change. I get a single-digit or teens feel from him. But we'll see. He was recalled to take the place of Ryan Church, now an unhappy resident of the disabled list. He's joined there by Jose Reyes whose absense -- along with Ramon Martinez's shaky credentials as a capable backup -- prommpted the Mets to make a deal with the Indians for their AAA shortstop, Wilson Valdez, once they agreed on the number of balls that make up a bag. Valdez was issued No. 4. The Mets went and won handily, getting an RBI groundout from Fartinez, a three-run homer from Gary Sheffield, doubles from Ramon Martinez and Omir Santos, and a complete-game from Livan Hernandez. None of these men were in even the wildest imaginations of Met fans as recently as March.